MKG Seattle Thai boxing fans make the annual trek to Portland, OR to see the legendary Grandmaster Chai! For those who would like to become instructors same day especially. Welcome to all styles, skill levels, new students and beginners! 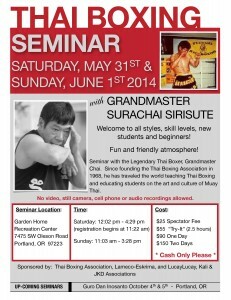 Seminar with the Legendary Thai Boxer, Grandmaster Chai. Since founding the Thai Boxing Association in 1968, he has traveled the world teaching Thai Boxing and educating students on the art and culture of Muay Thai. No video, still camera, cell phone or audio recordings allowed.